edit, compress and convert image bulk in one go: Let your computer do the work for you. Just open loads of images or a complete picture folder, enter your required settings and let the rest be done by your new fellow: PicShrink. No more technical issues to solve. Pictures are shown in pixels, instead of centimeter. Pictures for printing are generally shown in centimeter or inch. The resolution plays a prominent role, too. Printing data needs a resolution of 300 dpi (dots per inch), pictures for monitors only need a resolution of 72 dpi. PicShrink shows the size of the picture and resolution so you can adjust the optimal balance between print data and internet data. PicShrink finds the best balance of quality and size for web images. With PicShrink it is extremely easy to reduce your file size without any noticeable loss of quality. WYSIWYG – What you see is what you get! In preview mode PicShrink compares original and new picture. Settings in quality and size of a picture are shown in “real time”. You will know how your optimized picture will look like before saving it. This feature allows you to rotate your images or flip them horizontal or vertical. With the Auto Exif function PicShrink detects those images that have been captured with a camera that was held upright and rotates them automatically the way they are supposed to be. For a professional presentation you have the possibility to add a border in any size or color to your images. Protect your images with a watermark. Choose from text or image to add and place it anywhere you want on the picture. With this function you can cut the sides of your images to show only details and reduce background. Cropping size can be set by pixel or percentage. Settings can be used for batch cropping to process many images at once. Once you have copied images from your explorer menu, browser window or other PC application to your clipboard you can paste them into the PicShrink container to proceed with editing them. 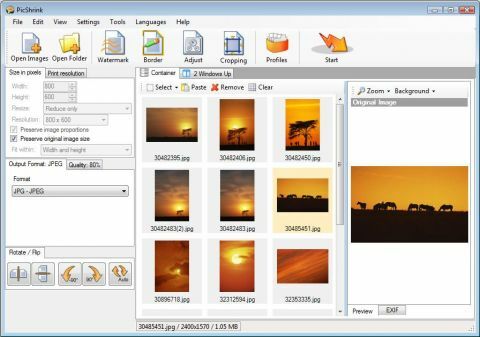 PicShrink 2.5 image compressor for photo compression, image format conversion and picture editing to shrink image filesize, resize images and convert image formats. 30 Days FREE Trial Period! *All online purchases are issued by our payment provider, Avangate. Prices displayed above do NOT include Sales Tax or Value Added Tax ("VAT"). Sales Tax applies to purchases made by residents of some US states, territories, districts and possessions (including, but not limited to, the residents of the State of New York). Value Added Tax ("VAT") is applicable to purchases made by residents of European Union countries, and (if applicable) is charged at the appropriate national rate for that country. The amount of Sales Tax or VAT (if any), and the total price of the product, is shown on the secure order form, after you select your country/state of residence, but before you give final confirmation that you do want to proceed with the purchase. How do I receive my registration details? Once you have paid via Avangate you will receive three e-Mails. The first contains the Online order confirmation and the second mail is the Payment Receipt the third email comes with your registration information. What happens if I lose my registration number? How do I enter my registration number? Just start PicShrink and put in the name and serial you have obtained from us. Best way is to "copy and paste" it when asked. What is the easiest way to purchase PicShrink? The easiest way is to purchase PicShrink is an online purchase with our secure and trusted partner Avangate. Can I order PicShrink by fax? Yes you can choose to order by FAX as a payment option from Avangate online. Will PicShrink be shipped on a CD? No, PicShrink is delivered as a download only. What is the best way to get a quote for a Site or Enterprise license? Please send an email to sales(at)topbytelabs.com and we will contact you with an individual quote matching your requirements. Having a problem with PicShrink? Our FAQ section below will help you find your answer. How long can I use PicShrink until I have to pay? You can evaluate PicShrink up to 30 days with all functionality for free. Please be aware that during the TRIAL period all images will contain a watermark. Is the paid version also adding a watermark to my images? No once you have registered PicShrink no watermark is added to your images. How do I purchase PicShrink? You can order PicShrink online from our payment provider Avangate. All online purchases are prosessed via Avangate to provide a secure online payment environment. What payment options does Avangate offer during the purchase? Every PC in my organization company needs PicShrink, do you have multi license discount? Yes please see our order section for multi license pricing. How Do I install PicShrink? Download the PicShrink setup from the download page on to your PC. Now enter the setup by clicking on the setup icon. PicShrink installation mode will be started and and you need to confirm the license agreement and choose your install location and finish the setup. PicShrink will be installed. No need to reboot your PC. PicShrink is ready to use. To install PicShrink you must have .NET 2.0 Framework or newer installed! How do I uninstall PicShrink? You can simply use the "add and remove” program in your control panel. Which image formats are supported by PicShrink Image Compressor? PicShrink currently supports JPG, PNG, BMP, GIF and TIF image file formats. What kind of function is Shell Context Menu Integration? Will PicShrink run on 64 Bit systems? Yes Our current version supports X64 Bit systems. Make sure you download our X64 version. Will PicShrink work with CMYK files? No, PicShrink does not support CMYK, yet. When opening CMYK images the preview might appear completely in black. Contact our support using the contact form and we will do our best in assisting you. Once PicShrink optimized a file can I revert to the original? Will PicShrink delete or destroy my original file? No. PicShrink creates a copy in a new folder that you specify. Unless you specifically choose to overwrite the original file. Can I use Picshrink from my file Explorer? Yes, PicShrink allows shell context menu integration. Just open PicShrink, click on settings and check "Shell Context Menu integration". After that you can close PicShrink, this option is now available once you right click on an image format that is supported by PicShrink. Will PicShrink run on Windows 7? Yes, PicShrink has been tested on Windows 7 and is fully operational.